The most important things that any half serious cook owns are a couple of good knives. Not a block of sixteen assorted flimsy efforts from IKEA, but two decent knives – one big cook’s knife and a smaller version – either German or Japanese, their edges honed to a razor-sharp finish on a steel or preferably a whetstone. These knives are the workhorses of the kitchen. Any cutting task can be accomplished with just those two knives. There are other specialist knives out there that might tempt the eye, and yes, heaving around a great big cleaver (six quid from your local Chinese supermarket) is kinda fun, but none of them are strictly necessary. Two knives, the best you can afford, German or Japanese, one big, one small. These knives are pieces of engineering marvel. They’re milled to micrometre level specifications by some of the world’s most skilled manufacturers. Looked after well, they’ll last a lifetime. Looked after poorly, and well, you may have well have just used one of your crappy IKEA knives to shred through £100. The second most important thing in any serious cook’s kitchen is a chopping board. There’s no more certain way to destroy a decent knife than using the wrong board, and the material that it’s made of is vital. Glass, granite, slate, or any type of kitchen work surface whatsoever are not suitable materials for cutting against. The thought of the edges of any of my knives meeting a glass chopping board fills me with terror. The only two materials that I’d even consider using are plastic and wood, and plastic only for meat and fish – there’s a minor advantage that you can chuck a plastic board straight in the dishwasher, which is great from a hygiene perspective when handling something like chicken. That’s not quite enough, though. 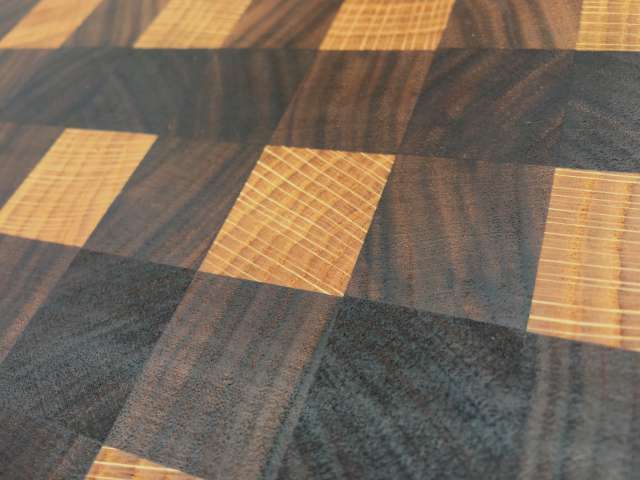 The standout king of the chopping board materials is wood. It’s kind to knives, lasts forever, harbours natural antiseptic qualities, is sturdy, beautiful and affordable. My main chopping board is nearly twenty years old, and gets used every single day, requires little in the way of maintenance , and represents a central practical and aesthetic piece of my kitchen. 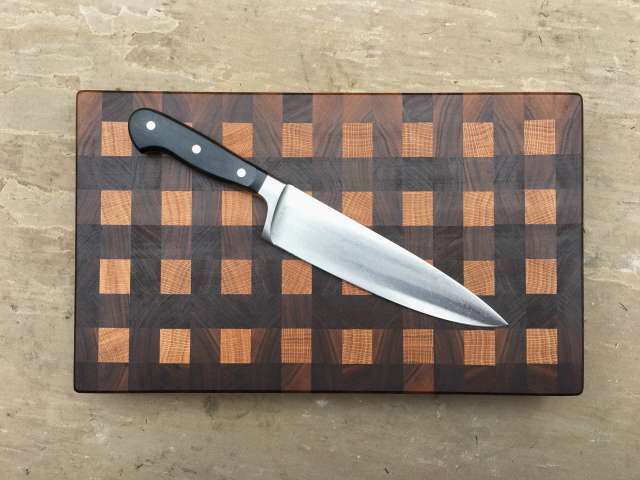 There is simply nothing better than a well-made, well-used wooden chopping board, and this one from The Wooden Chopping Board Co. is one of the best. It’s a gridlock pattern of end-grain black walnut and oak pieces, glued together and milled smooth to a thickness of just under 5cm and a size of 40cm by 28cm, so a substantial and sturdy piece of wood, weighing in at about 3kg. It has rubber feet screwed into the base to keep it still in use, which given the sheer weight of the board, seem a little like overkill – believe me, that board isn’t slipping anywhere at all at that weight. Walnut isn’t a particularly hard wood, but it can stand a lot of use and still look great. 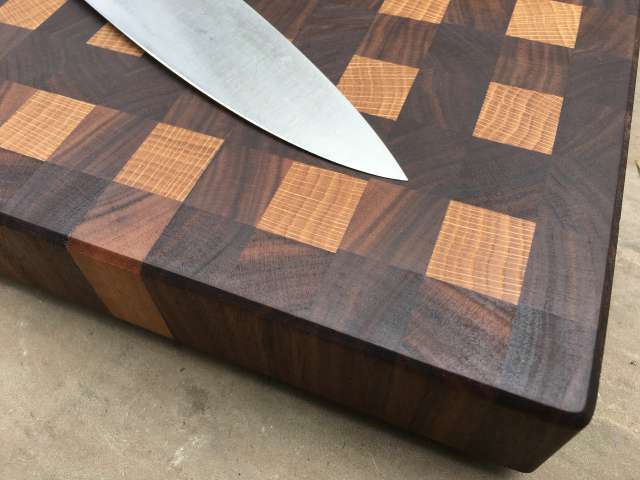 As an end grain cut, that is, the cross-section of the wood is presented upwards as the surface of the board, this board is slightly kinder to a knife than a linear grained board. In use, a knife will actually cut into the wood, sinking into the grain, which will then naturally spring back and ‘heal’. It’s this healing capability that makes wooden chopping boards such an effective and hygienic option … bacteria is literally pushed back out of the board. As a chopping board, this Wooden Chopping Board Co. board performs just fine. As an object, it’s just stunning. The contrast of black American walnut and lighter, honey brown English oak is striking and beautiful, and the chess board pattern is attractive and contemporary. I’ve become slightly addicted to those YouTube woodworking videos recently, the ones that step through the build of something or other in double-quick time, and I understand the time and the technique that goes into a board like this. In short, there needs to be a lot of attention paid to getting each of those blocks shaped to an exact tolerance, before sticking them together and cutting the board out crossways. It’s not easy, it needs a fair amount of specialist woodworking gear to achieve, and it takes patience. The results are lovely, and as just one example of a wider range of boards available from The Wooden Chopping Board Co., it’s a fine example of just what they can do. This astonishing board was provided by The Wooden Chopping Board Co. for review purposes. Lucky you! Beautiful board. I have a very modest one here and my favourite knife is French. That’s the big knife…. the smaller version is also French but I tend to do everything with the big one… frustrating when I am chopping/cutting away from home as I miss my knife. Looks like an intriguing new board – the healing feature sounds amazing – it would be a shame to mark such a lovely piece with knife cuts! That is just awesome dude. I love the contrast and it looks sturdy, not like those thin ones that you get. That’s a nice looking knife too. I cant make out any branding on it though. Who makes it? Wonder if I can afford one. It’s a Wusthof, 12″ cook’s knife.